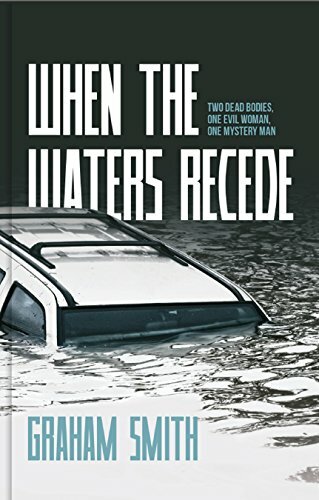 Firstly I wish to thank Graham Smith, the author, and Rachel Gilbey of Rachel’s Random Resources for inviting me on this Blog Tour for When the Waters Recede: Two Dead bodies, one evil woman, one mystery man. This is one pure adrenaline crime lovers fix from the opening chapter to way past closing the book so be prepared for buckling up for a day. The fast paced action and heart in your mouth moments just make it a perfect balance of work and personal situation dilemmas for the team. After a car has been pulled from the flood waters it holds a gruesome discovery in the boot, that of the body of a headless woman and a dead mystery man still sat at the wheel in the car. This is just part of the spidery web of investigations that the unpredictable and determined Cumbrian team get their teeth into this time. Oh boy this story just gets better and better from the uneasy feeling twinges I just began with to I need more oxygen moments that just blew me away. This is just pure pulse pounding perfection! Whoa Graham Smith knows how to hit that spot that just freezes moments where you stop the race to get to the good bit because it just may be the outcome that you don’t want. I was in frenzy heaven because I had to dive back in. Oh wow! OH WOW! What a story! This book can be read as a stand alone but really get in and read the series and get to know the team. Love how although this is a complete story the personal drama of the team is left in the balance. My mind is already spinning and my pulse rising for what is still to come. Superb! Graham Smith is the bestselling author of two explosive crime thrillers in the Jake Boulder series, Watching the Bodies and The Kindred Killers. Watching the Bodies spent over two weeks at number one in the Amazon UK chart and Amazon CA charts. Graham is also the author of the popular DI Harry Evans series and has collections of short stories and novellas. He is the proud father of a young son. And as a time served joiner he has built bridges, houses, dug drains and slated roofs to make ends meet. Since 2000 he has been manager of a busy hotel and wedding venue near Gretna Green, Scotland. An avid fan of crime fiction since being given one of Enid Blyton’s Famous Five books at the age of eight, he has also been a regular reviewer for the well respected review site Crimesquad.com since 2010. As well as reviewing for Crimesquad.com Graham has also interviewed such stellar names as David Baldacci, Jeffrey Deaver, Dennis Lehane, Lee Child, Matt Hilton, Peter James, Mark Billingham and many others.